The Chinese government has cleared a version of the iPhone to use the country’s mobile networks and posted pictures of the handset online, just as carrier China Unicom prepares to launch the phone. Pictures of the licensed 8GB iPhone appeared on the Web site of the Telecommunication Equipment Certification Center, an organization under China’s IT ministry. The 8GB label on the licensed handset may mean it is the iPhone 3G, not the iPhone 3GS. China Unicom late last month said it would launch the iPhone in the fourth quarter and that models it offers will include the 8GB iPhone 3G. 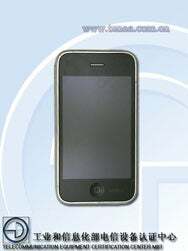 China Unicom also said it will offer the iPhone 3GS, but only 16GB and 32GB models of the handset were listed in a document on its Web site. The China Unicom iPhones will not have Wi-Fi, which China only allows on handsets that support a locally developed security protocol for wireless networks. The network license for the iPhone, which clears it for sale in China, was issued on August 25 and will last for one year, the government Web site showed. The phone was listed as supporting the 3G standard being promoted by China Unicom, WCDMA (Wideband Code Division Multiple Access). The iPhone is already popular in China among well-off urbanites who get the handsets abroad or buy phones imported on the gray market. There are about 1 million iPhones already in China, consultancy Ovum estimates. The official iPhone will still have to compete with the gray-market versions, which have the advantage of including Wi-Fi. The China Unicom iPhones will be the first official model offered in the country, but the deal does not bar Apple from finding other iPhone distribution partners in China. China Mobile, the world's largest carrier by subscribers, has said its talks with Apple about offering the iPhone have reached no conclusion yet.